When organizing your bathroom, it’s normal to prioritize the items that you and your guests will see each time they enter. However, what can often get out of hand are the areas that people don’t always see, such as drawers and cabinets. It can be frustrating and overwhelming to sort through a cluttered and disorganized medicine cabinet that is full of outdated and obsolete items, so this post will provide you with a few basic tips to restore your medicine cabinet to its most organized, functional, and presentable state. Before you start organizing your medicine cabinet, it’s best to take everything out and get rid of any items for which you have no use. This involves checking the expiration dates on all of your medications and tossing the expired ones. You should also take a look at some products that may be past their prime, such as old Band-Aids or dried out face wipes. Your medicine cabinet will be much more manageable and easy to navigate if you can reduce its contents to the items that you will actually use. While you’re at it, this would be a good time to clean the cabinet itself. Use the temporarily empty cabinet as an opportunity to do some dusting and to wipe down the shelves, so when you place the items back in the cabinet they will be stored in a clean area. 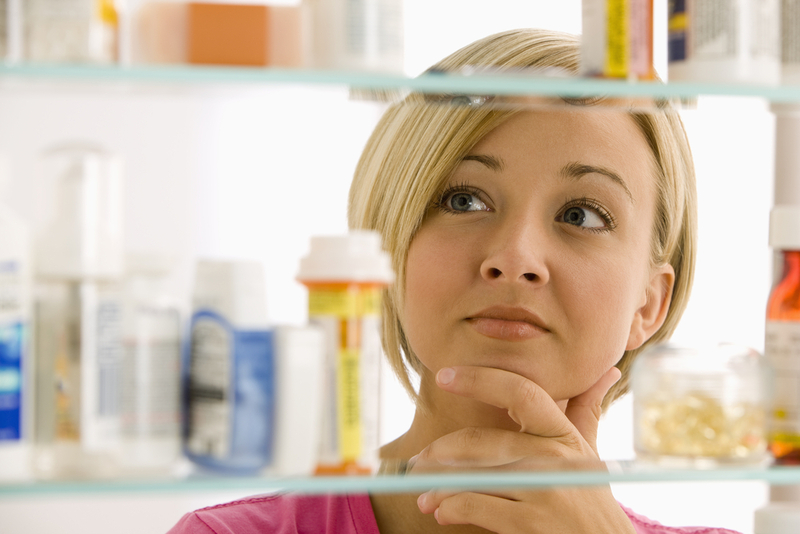 Another good way to reduce clutter in your medicine cabinet is to evaluate which items you’ll need easy access to. For example, you’ll want your toothbrush and other dental care products to be readily available, along with other daily hygiene medications and frequently used medications. If you wear contacts, then go ahead and place your lens case and contact solution within easy reach. However, your medicine cabinet can quickly become overcrowded if you use it to store items you only use every few months. For these products, it’s best to find a separate storage solution, such as drawers or a separate storage cabinet. This way, you’ll still have access to these items, but they won’t be taking away from the limited space in your medicine cabinet. Now that you’ve reduced the contents of your medicine cabinet, you can begin to establish an organized system. For example, you can reserve the top shelf for first-aid supplies, such as Band-Aids and disinfectants. In this same section, you can place items such as tweezers and nail clippers, since these do not take up too much space and will be used with similar frequency. You can designate the next shelf for your daily use items, such as your toothbrush, toothpaste, contact supplies, and deodorant. Finally, you can use the rest of the space for beauty products. Create an area for your makeup, hair products, face wash, and similar products. The key is to group similar items together, which will make it easier to keep your cabinet organized over a long period of time. Now that you’ve created a more organized system in your medicine cabinet, you can choose to add some extra pieces to help out with storing certain items. For instance, you can get a small toothbrush holder in case you have multiple toothbrushes in your cabinet, which will help keep them clean and separated. You can make use of small jars for items such as Q-tips or gauze pads. This last part is optional, but it might just provide the finishing touches on a neatly organized medicine cabinet. While it is understandable to prioritize with organizing the more commonly seen parts of your bathroom, you don’t want to let your medicine cabinet get out of hand. A disorganized medicine cabinet can be a nightmare, both for you, and on occasion, your guests. Often times when this area becomes cluttered and disorganized, it can be difficult to decide where to begin, but with these basic tips, you can be well on your way to creating a neat, clean, and organized medicine cabinet in your bathroom. From minor improvements to complete overhauls, kitchens and bathrooms typically see the most renovation work over the course of a lifetime. While some improvement projects require the expertise of a contractor and qualified workers, some are easy enough for almost anyone to complete. Although repurposing vintage furniture into a stylish and chic bathroom vanity isn’t an entirely new concept, the notions of upcycling and repurposing have grown more popular in recent years. If you’re considering bringing some unique, vintage style into your bathroom, read on for some repurposing tips. The “new rule” for standard bathroom vanities is that the countertop should be 34-36” from the floor. In older homes, you may notice shorter vanities – the older standard was 32-34” off the ground, likely because the present population is taller in comparison. Since it’s difficult to find a vintage piece at the standard bathroom vanity height, the rules change when repurposing vintage furniture into a vanity. Instead of bringing a tape measurer with you while shopping, keep these questions in mind: can you comfortably brush your teeth while standing in front of this piece? If you hang a mirror above the piece will you be able to see your whole face? As long as the height is comfortable and practical for you and the rest of your family, go for it. If you’re set on keeping your vanity at its standard height, consider mounting the vanity to the wall to make up the difference. The truth is, repurposing vintage furniture for use in other rooms of the home is much easier than the bathroom, where moisture and steam are daily occurrences. In some cases, you may be forced to choose a new top surface in order to escape the accumulation of mold or gradual deterioration of the piece over time. Hardwood surfaces can be used in a bathroom, but only if they’ve been waxed or oiled over the years and are intended for use in a bathroom that gets low-to-regular use. However, if the existing surface is delicate, already in need of repair, or will be used in a public, family, or children’s bathroom, you should consider exchanging the top surface for something with a bit more durability. Marble and quartz are durable choices that are an aesthetic match with most vintage furniture. Unfortunately, not all pieces of antique furniture are suitable for a conversion to plumbing. If you’ve decided that the vintage piece can be adapted to modern plumbing, you’ll need to carefully plan out the process. You’ll need to accommodate the sink and its plumbing for a proper fit, spend time waterproofing the piece both inside and out, or you may have to replace older wood tops with granite or other natural stone slabs. If you love the look of vintage furniture but aren’t sure you have the wherewithal to adapt the piece of furniture on your own, you can either call in the professionals or find a line of reproduction pieces – they’ll be designed for modern plumbing without losing their vintage look and feel. Since the DIY vintage vanity is almost guaranteed to be the focal point of your bathroom, it’s important to keep everything else in your bathroom as minimalistic as possible – otherwise your guests may feel bombarded with things to look at whenever they need to wash their hands. Your hardware choice should complement the look of your antique vanity. In many cases, brushed nickel or distressed bronze faucets are great choices, while polished and shiny faucets may distract from the overall vintage look of your bathroom. For countertop accessories, such as soap dishes or toothbrush holders, head to your local antique shops. 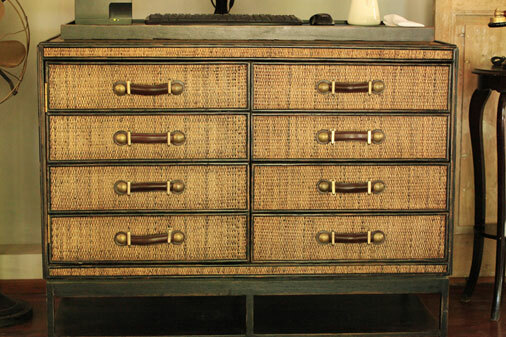 Even if you don’t find what you’re looking for in an antique shop, you may be inspired to repurpose another antique piece into something new. Since the bathroom is one of the few places where you can relax without interruption, it’s important that it reflects your personality and unique style. Studies show that if you’re comfortable with your surroundings, you’ll be happier and healthier while spending time in your home. By decorating your bathroom according to your personality, you’ll feel at ease while taking a bath or energized while getting ready in the morning. With all the wall color, vanity, and tub options available on the market, why not match your bathroom to your personality? If you’re curious about how, here’s our guide for bringing your personality into your bathroom. Adding color to your bathroom is perhaps the easiest way to breathe some life into your bathroom. Whether you like to relax in your sunken tub after a long day at the office or prefer an energized space when getting ready in the morning, there’s a color for that. While white is a popular choice for minimalists, bright bathrooms are all the rage. In fact, some of the most beautiful bathrooms pair striking accents with muted backdrop: purple against white, sea foam green against grey, or a vivid yellow against natural wood. If you prefer a more neutral bathroom, consider keeping things light – light brown, light greys, or light tans. Darker tones, such as deep reds and browns, are perfect for those interested in bringing feelings of warmth and comfort into their bathroom. Before choosing a vanity style or color, it’s important to decide on a type. If you have the extra square footage, most experts recommend purchasing a double vanity – potential homebuyers will see it as a perk, and you’ll enjoy the extra counter space in the meantime. If you consider yourself to be light-hearted and easygoing, a vanity made of teak wood may be the perfect choice for you. Since teak contains hints of yellow and tends to reflect light better than other types of vanities, a calming or soothing effect will take over your bathroom. If you’re more of an introvert, a vanity made of mahogany wood will bring class and formality into your bathroom. It may sound silly, but different faucet finishes can evoke various styles and personalities. If you consider yourself to be traditional or classy, easy-going finishes such as polished silver or white porcelain are a great way to bring a bit of sophistication into your bathroom. If your friends would describe you as being adventurous or daring, head to your local antique store – you’re sure to find a great selection of antique and vintage door handles and cabinet knobs. And, if you’re feeling especially crafty, you can make your own cabinet knobs using just about anything, including wine corks, broken jewelry, pebbles from the garden, bent spoons, and rulers. One of the best ways to match your bathroom to your personality is to create a one-of-a-kind DIY piece. If you love to travel, create a collage using old map books – just be sure to frame the piece in a humidity-resistant frame. Since bathrooms are one of the most humid rooms, special care needs to be taken when choosing artwork to display. For more information, click here. Other fun projects can include using an old ladder as a display area for plants, making your own homemade soap in unique designs and colors, or painting your doors with chalkboard paint and writing inspirational quotes or music lyrics on the inside or outside of your bathroom door. When it comes to these projects, don’t be shy – your bathroom can never have too much personality.